It was wonderful to have a small group from the Phnom Penh church greet us at the airport when we arrived this past Thursday. We are blessed to be back in Cambodia after our very quick 5 month furlough. The last official ministry responsibility that we fulfilled prior to leaving for the States 5 months ago was to bury the baby of one of our families. You may recall that Ooeun and Srey Touch had a very serious motorcycle accident and their daughter, Linda, was killed instantly. In America it seems to be a rare thing to have an infant die. Here is Cambodia it is a different story. Sadly babies die very often here in this country. Sometimes it is due to the health of the mother and a serious lack of nutrition and adequate pre-natal care. Other times the babies die because of the dire conditions that are found in the medical facilities as well as the lack of compassionate and competent care by the medical “professionals.” Such was the case with Brother San and his wife Yom. This young couple has taken a very strong stand for the Lord and has grown so much over the past two years. (Yom was saved just two years ago.) They have been looking forward to the birth of their first child with great anticipation. For reasons that I don’t fully understand, the baby boy was born this past week and died just 10 minutes later. This tragedy has hit them rather hard as could be expected. Had there been proper procedures at the hospital the baby would have likely been fine. Please pray for San and Yom as they are grieving. The baby was buried on their land in the Cham village which has caused quite an uproar. So not only is this Godly couple going through the personal pain of losing their son but they are also under heavy persecution from the Muslims in their village. Please pray that they will endure this trial and grow in their faith as a result. Yom was released from the hospital Friday morning and I was able to go and visit with her very briefly. It was a wonderful blessing to see Ooeun and Srey Touch, who lost their baby daughter just months prior, there in the hospital room seeking to encourage San and Yom. No doubt God has allowed this trial in their lives for a reason. It was wonderful to be able to once again fellowship with our people today at the church. 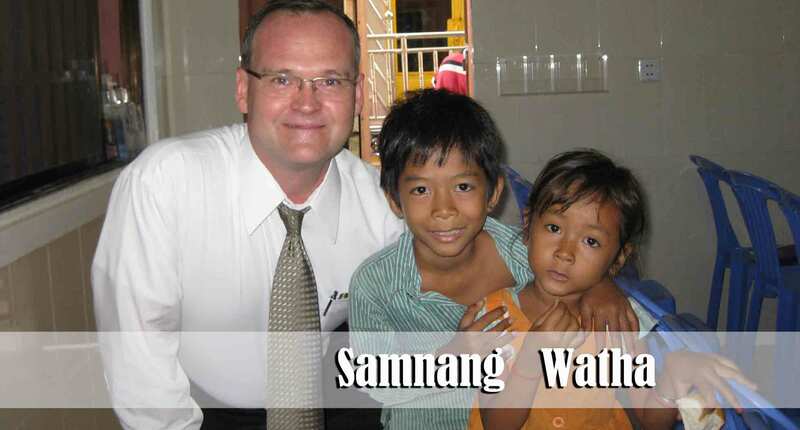 Samnang and Watha have been attending the church for the past two years. I wrote about them last year. You may remember that they are almost always the very first people to arrive each Sunday morning. (blog update from January 1, 2012 https://goodnewsfromafar.wordpress.com/2012/01/01/january-1-2012/) This brother and sister truly represent the desperate poverty that exists in this land and even within our own church. Debbie remarked to me this morning that they were both wearing the exact same tattered clothes they were wearing 5 months ago. More tragic than the physical poverty is the pervasive spiritual poverty here in Cambodia. We thank the Lord for faithful Christians in America that are making it possible for us and other missionaries to bring spiritual and physical hope to these people. I m really glad to see people smiling . I feel the picture is pulling me into it’s world . Seeing what God is doing in Cambodia sure is changing my way of thinking. I’m thankful that I met you and was able to talk to a man of God. I’m sure I will do what I can to pray and hope to see the blessing of the harvest ! Thank you and please ask the Church to pray for me too!